The seaside resorts of the Adriatic Coast in the Le Marche region are crowded only from mid-July to the third week of August when the Italians take their annual holidays. The rest of the time when the weather is hot, you’ll have plenty of space and find the Italians looking at you strangely and wondering why you are on the beach outside peak period. Although all resorts on the Adriatic Sea in le Marche have scetions of free public beach (spiaggia libera), it’s not as well kept and clean as the private beaches. For a proper Beach holiday in Italy and the real Italian beach experience you will need to bite the bullet and select one of the private Italian Adriatic beaches denoted by their uniform banks of umbrellas and sun beds. These are not usually that expensive, especially if you wish to take advantage of their facilities which include changing rooms, showers, toilets, childrens playgrounds and restaurants and bars. They are also the best place to watch Italian holidaymakers on the Adriatic Coast up close and compare the peacocks strutting along the shore in their dark glasses and revealing beachwear. 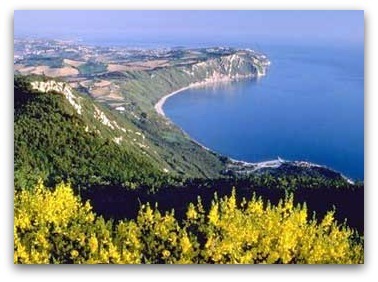 The Adriatic resorts of Le Marche include one of the highest number of beaches of any region in Italy that have won the prestigious European Blue Flag award for environmentally well-kept beaches. The important “eco-label” is given to parts of the coast that meet strict criteria including beach water quality, environmental management, safety and other services. 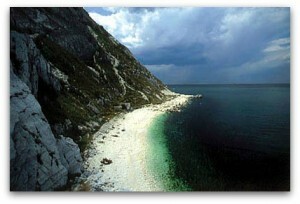 This small adriatic resort is deep in the Conero national Park and is found at the end of a windy road with great views. The sandy Adriatic beach; which has plenty of restaurants and bars is split in two by the Fortino Napoleonico, a fort (now a hotel) built in 1808 by Napoleon’s Italian Viceroy to fight off English ships. As the lush Conero oaks reach the sea at Portonovo you will see the Romanesque church of Santa Maria. Built between 1034 and 1048, its Norman form is strangely unique in Italy. To the north of Civitanova Marche and also close to the B&B is Porto Potenza Picena – it has a good sandy beach and is near the lovely town of Potenza Picena and the well preserved 18th century Villa and gardens at Giardino Bonaccorsi. Four km inland from the beach at Civitanova Marche is the Medieval hilltop town of Civitanova Marche Alta, It often hosts Summer festas and pageants within its medieval walls amongst the ancient palaces and churches and has an extremely good modern Italian art gallery in the civic Galleria d’Arte Moderna. One of the Marche’s earliest and most distinguished churches, Santa Maria a Piè di Chientiis 6km away on the SS 485. This beautifully preserved romanesque structure originates from the 9th Century. It houses impressive 14th Century frescoes in the apse above the upper altar. The port that once serviced the Roman town of Fermo is now a stylish sandy seaside resort on the Adriatic with a small working port. There is a small but eclectic mix of shops and in high summer the place comes alive with gigs, festas concerts and other entertainments. 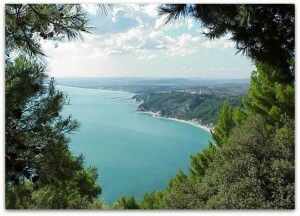 South of Porto San Giorgio is Pedaso, The Adriatic Coast of Le Marche’s “mussel beach” – the seafood delicacy is farmed on concrete pillars off the coast, Pedaso has a short, gravely beach and is home to scuba and skindiving. 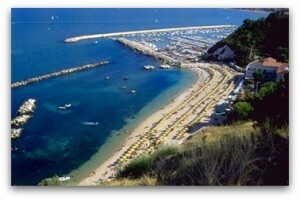 The Adriatic Riviera resort of San Elpidio lies to the north of Porto San Giorgio, it has a long beach accessed through pine woods at the northern end and many outlet shoe shops on the SS16 road. There are also some good restaurants and kids play areas some with zipwires. Far from the madding crowd and untouched by mass tourism, this tranquil Le Marche resort on the Adriatic sea is surrounded by lush vegetation. This Adriatic riviera resort has a good spacious clean sandy beach (2.5kms long), and an attractive port overlooked by the fortified medieval walls of the town. It also has an interesting shell museum.